The Institute of Marine Research commenced a program for mapping and assessment of Lophelia reefs in 1997. It was initiated by reports from fishermen claiming that bottom trawling damaged deep-water coral reefs. The strategy was to survey coral sites reported in the literature and by the fishermen. This has provided an extensive database of coral occurrences, both damaged and undamaged sites. 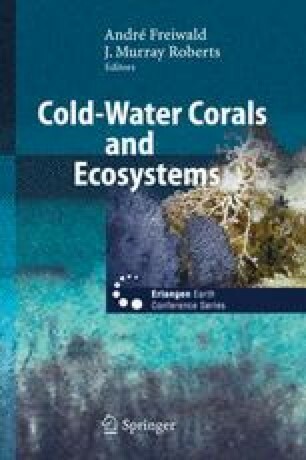 A number of major coral reefs have been identified, which has provided a better understanding of the morphology of Lophelia reefs and where they are likely to occur. We are now able to identify potential coral areas by analysing seafloor topography on maps. Fast and reliable ground-truthing methods using simple and inexpensive systems have been developed. Mapping and quantification of corals demand more advanced instrumentation, such as singlebeam and multibeam echo sounders in combination with data processing software allowing coral reefs to be detected in real time. Systems providing real time presentation of multibeam data are especially useful in combination with Remotely Operated Vehicle (ROV) positioned with acoustic navigation systems. We suggest the following mapping procedure: 1) acoustical reef detection followed by multibeam mapping, preferably along with collection of seismic reflection data. 2) ground-truthing with a tethered video camera platform or an ROV. The position of the observation platform is plotted online and draped on the multibeam maps, either in 2D or 3D mode. Examples from the reefs on Sula, Røst, Træna and Fugløy are given.